Jacksonville, FL--No, we are not yet on the road again. But we have hopes of hitting the pavement in less than two months. Jim should have the siding on the house done next week (unless we have bad weather). Once that he done, he has to repair the swim-spa, then install a base plate on our Ford Edge (and maybe a hitch, too, so we can haul a small boat), and then we will finally be ready to go! 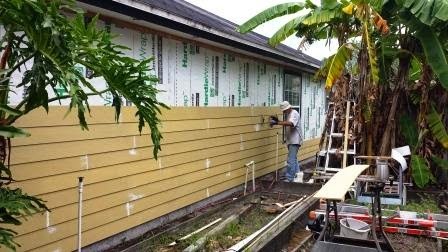 Jim is busy installing siding on the south side of our house. 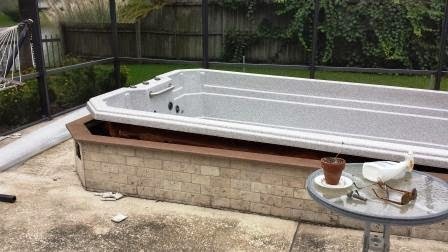 The poor swim-spa popped out of the ground. After we emptied its water and before we could refill it, we had a downpour that caused this malfunction. It has to be reinstalled. 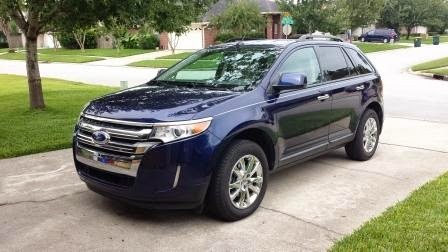 We love our 2011 Ford Edge. It needs a base plate so we can tow it. And we want a hitch on the rear end so we can pull a small boat (not while we are towing it, however). In the meantime, I am always looking for economical ways to remain connected while we are on the road. This is especially important when I am working on a freelance project, as I have been doing for Reed Business Systems for the last couple of months. Although many RV parks claim they have WIFI, usually it is impossible to connect, unless I take my computer up to the clubhouse, something that is not very convenient to do. My first venture into mobile computing was a Virgin Mobile broadband stick. It was 3G (which was the best technology back then, in the "dark ages" of only four years ago). It worked pretty well, although coverage was not the best. Also, connectivity was limited to one device. My next purchase was a T-Mobile hotspot device. It was 4G, and I could purchase data without having a contract, just as I could with the Virgin Mobile device. Not have a contract is important to me. I don't want to pay for months I do not use the data. T-Mobile was the most economical of all the no-contract plans I could find. However, T-Mobile's coverage is sometimes spotty, as we discovered in Georgia and also the Keys. I've investigated other hotspot devices and service plans, but today we came across a special offer from Karma Go. The offer came through a CNet newsletter Jim and I subscribe to, Cheapskate. This daily newsletter alerts us to special deals, many often free. After much evaluation of the offer, I decided to take advantage of it, even though it meant purchasing yet another device. The Karma device, in this special offer (which is only for the next couple of days), is $99, and through the offer, we get 1 GB of data free. We will be able to purchase 10 GB at a time, for $99. The good thing: The data never expires. Karma is using a different approach to marketing, too. The device allows up to eight people to use the hotspot at one time. Aside from the owner, those eight could be strangers. Not good? Not really. They can't get into the owner's data. To use the hotspot, they have to open an account. When they do that, they get 100 MB free data, and 100 MB of free data is also added to the owner's account. Their use does not take away from the owner's data, either. It's their own 100 MB. Karma uses Sprint's LTE (and 3G, if LTE is not available) network, which is what most of the other no-contract no-name carriers use (e.g. Virgin Mobile and Freedompop). That was actually one of the primary reasons I decided to splurge on the new device. My T-Mobile is 4G, not LTE. And LTE is a whole lot faster than 4G. (I can still use my T-Mobile in areas where Spring is not available.) Spring has also extended its coverage. It's not nearly as good as AT&T and Verizon, but it looks to be better than T-Mobile. My device is preordered; it won't arrive until December. But that's OK. If we hit the road before then, I still have my T-Mobile hotspot. If you do any traveling or just want to have connectivity wherever you are, you might want to consider Karma. (When you click on the link, scroll down until you see the hotspot.) But do it quickly. The offer is only good for four more days.